The Presidents of the People's Republic of Ztumsia and the Republic of Setumsia met in London last week and signed a peace accord which brought an end to fighting between their countries. But hopes that this move would bring peace to the whole area were dashed when their countries' armies joined forces to launch an attack on YIDZ and ZITS forces in the Ztumsia - Setumsia border area. President Ngobi of Setumsia and President Donunga of Ztumsia signed the treaty, brokered by the British Government, at Lancaster House in London. It marked a major reconciliation between the two former friends, who fought side by side in the War Of Liberation before falling out after victory had been achieved. The peace treaty involved a slight adjustment of the Zetumsian - Stumsian border as well as an exchange of political prisoners. Two days after the accord was signed the Army of the Republic of Setumsia (ARSe) and the People's Army for the Nation and Tribes of Ztumsia (PANTZ) launched Operation Rolling Thunder, an attempt to drive a wedge between ZITS and YIDZ forces controlling Highway 6, the main road from the Ztumsian Highlands to the coast and used for the transportation of illegally mined diamonds. This trade is dominated by Petramco, the multinational conglomerate responsible for much of the unrest in the region and paymaster to the ZITS and YIDZ. There were tears of joy and wild celebrations as ARSe and PANTZ soldiers, many of them veterans from the War of Liberation, met as friends for the first time in over five years. 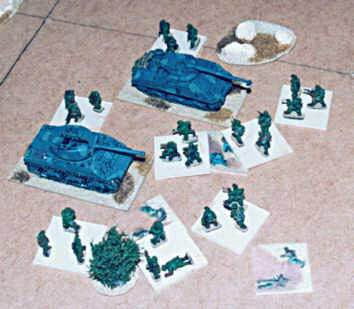 The allied infantry took up positions controlling the road and made ready for the inevitable counter-attack by the ZITS and YIDZ, while their united armoured units formed a central reserve. Despite repeated attacks PANTZ troops held hill 325 all day. Fighting contimued throughout the day with a confused armoured melee breaking out on the plain while hill 325 was subjected to repeated atttacks from all directions. PANTZ Commando 2 held on heroically under intense bombardment from mortars and tanks, repulsed two infantry attacks and destroyed several tanks. They were still holding the hill, resisting an attack by YIDZ professionals, as night fell and Captain Morrishombe was later awarded the Presidential Medal for Valour, Ztumsia's highest award for bravery. They were briefly aided in their defence by a unit of ARSe technicals which arrived late in the afternoon but got bogged down in an unexpected area of rough ground before it could deploy properly and was routed by heavy concentrations of enemy mortar and machine gun fire. The village of Makarawo was held by an elite unit of ARSe infantry who eventually got bored with watching the armoured combat on the plain and came out of the village to stalk enemy tanks. Their success in this enterprise made a significant contribution to the eventual destruction of the ZITS and YIDZ armour, bought at a high price in ARSe and PANTZ tanks. The YIDZ and ZITS captured three villages in the area but lost heart after the loss of all their armour and retreated overnight leaving the ARSe and PANTZ allies holding the strategic central ground and still blocking Highway 6. The outbreak of peace between Setumsia and Ztumsia has to be good news for the region. The emnity between Presidents Donunga and Ngobi was always a bit of a mystery, a falling out between friends, and the war between their countries has been a major factor holding back economic development for over five years. The fighting between the two states has allowed other forces, mostly those backed by Petramco, to carve out areas of interest in the region, much to the disadvantage of the indiginous population. The peace accord signed by Presidents Ngobi and Donunga has been presented to the world as a sudden development. But Ztum-Setum Weekly News has uncovered evidence suggesting that news of the peace process has been deliberately concealed from the outside world to allow for an increased element of surprise for Operation Rolling Thunder. ARSe and PANTZ have been exchanging military observers for several months and this certainly seems to have worked to their advantage at the battle of Makarawo (see above). We welcome the two Presidents' stated intention to throw Petramco out of Ztumsia and Setumsia and to bring local resources under local control. This evil corporation has been plundering our country for too long. MPs from the opposition Zion Labour Party have called for the Zion Government to cease using YIDZ (Young International Defenders of Zion) forces to protect Petramco interests in Ztumsia . The call follows a battle near the town of Namutoni in which a force of YIDZ suffered extremely heavy losses whilst supporting their PISSOF (Petramco International Security Service Overseas Force) allies in an attempt to defend the town against a strong force from the People's Army of the Nation and Tribes of Ztumsia (PANTZ). A YIDZ column of almost five hundred men was deployed in defence of the town but was routed after PISSOF reinforcements failed to arrive as promised. PANTZ forces later occupied the town, home to several Petramco facilities including their area office for the West of Ztumsia. Two companies of YIDZ infantry were killed or captured to a man. 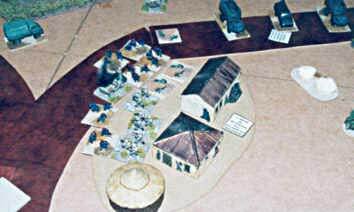 The town of Namutoni was attacked by two PANTZ columns, a light column of infantry and a heavy column with tanks, mortars and an elite unit of SAPS (Special Armed Police Service). The heavy column was directed against the YIDZ forces and their overwhelming firepower superiority soon routed a unit of YIDZ armoured infantry. The SAPS stormed some YIDZ infantry deployed in the village of Minimabote and killed or captured the entire unit with no loss to themselves. A third unit of YIDZ infantry routed after being caught in a horrific crossfire between two PANTZ tanks and supporting mortars. 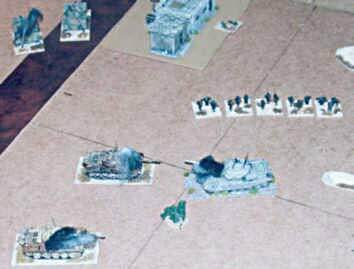 The PANTZ light column made significant headway against the PISSOF forces though one unit routed after a brave attempt at close assaulting some PISSOF tanks. 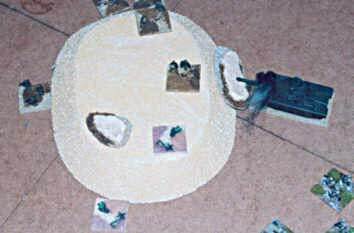 The force of this attack led the PISSOF leader to flee in fear for his life, supposedly going to locate reinforcements. As night fell the PANTZ were in firm control of all the significant high ground overlooking Namutoni and they entered the town in triumph early the next morning. MPs in the Zion parliament were visibly stunned when the defeat was announced and opposition MPs were quick to condemn the government for allowing YIDZ forces to become involved in what they desrcibed as the internal matters of another country. "We should be preserving the army for our own defence", he said. It is criminally irresponsible that the government should allow these brave volunteers to lose their lives protecting the interests of a foreign multinational", said Gordon P. Dian, Opposition Defence Spokesman and brother of the YIDZ C in C.
Dr Deek Donumnga , President for Life of the People's Republic of Ztumsia, has called on Petramco to settle the tax dispute that started the current fighting. "This is all so unnecessary" he said. "All we are asking is that Petramco should pay the taxes that they are due. At the moment they are stealing our resources and providing nothing in return." He also called on the Zion Government to withdraw their troops from Ztumsia . "The Young International Defenders of Zion are dying to support a corrupt multinational company with no interest in Africa other than the wholesale theft of our natural resources. We have no argument with the people of Zion, just the government who has launched this ill-advised exclusion into our territory. After the battle Ztum-Setum interviewed a YIDZ officer who wished to remain anonymous. "We were badly let down by our so called allies", he said. "Most of them were cowering in the streets of Namutoni, afraid to come out. They left us completely in the lurch. Petramco refused to comment, though it is rumoured that the PISSOF officer corps is to be purged once again.